If you also like to do your own home improvements then we would like to say that you are at a very right place! Here you can find countless different projects concerning to your home developments in medium of pallets! 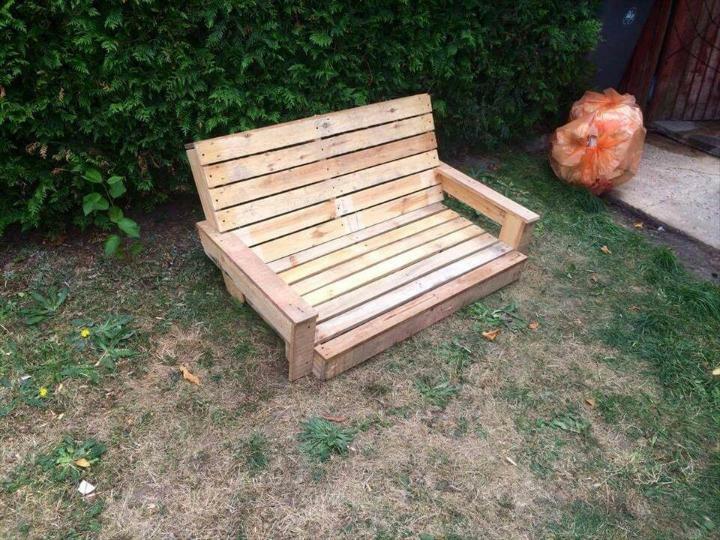 Pallets are being recycled more than anything that is lying useless or retired in your home surroundings! 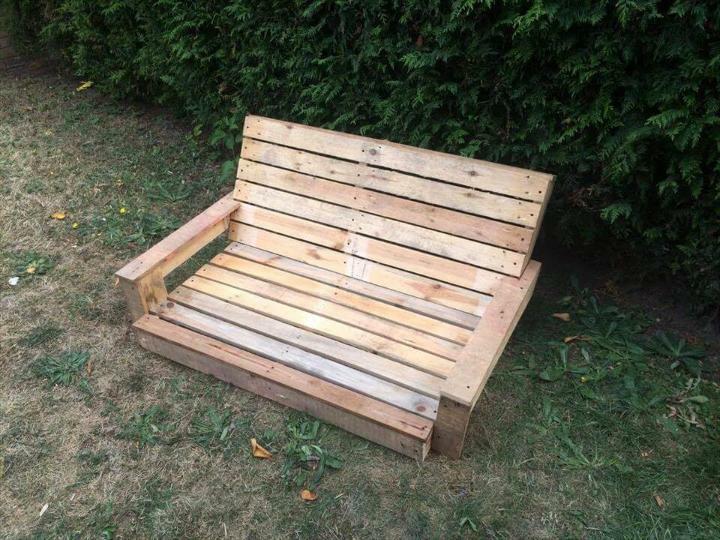 Rebuilding pallets into special and custom kinds of furniture crafts, to use them for outdoor landscaping and also to renovate and spice up interior with them are the fundamental traits that are inducing the people around the globe to DIY them for any custom purpose! 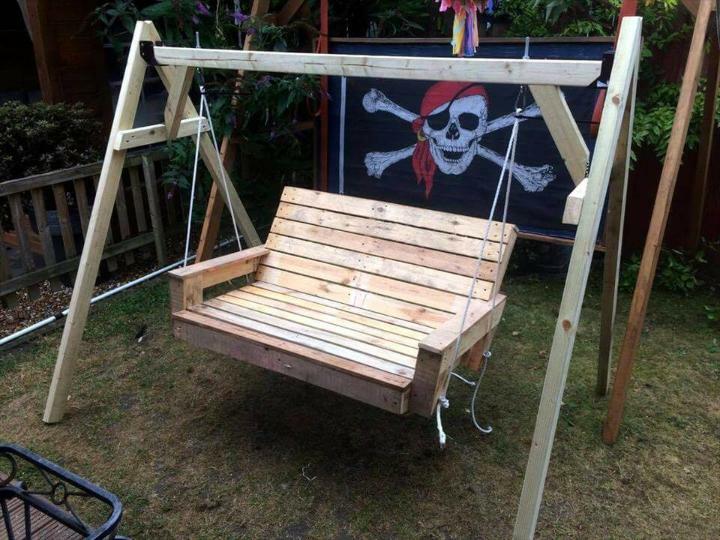 Here we have picked this DIY pallet swing tutorial to share with you, would be something you will preferred first while getting your outdoors kids-friendly or fun-making ones! 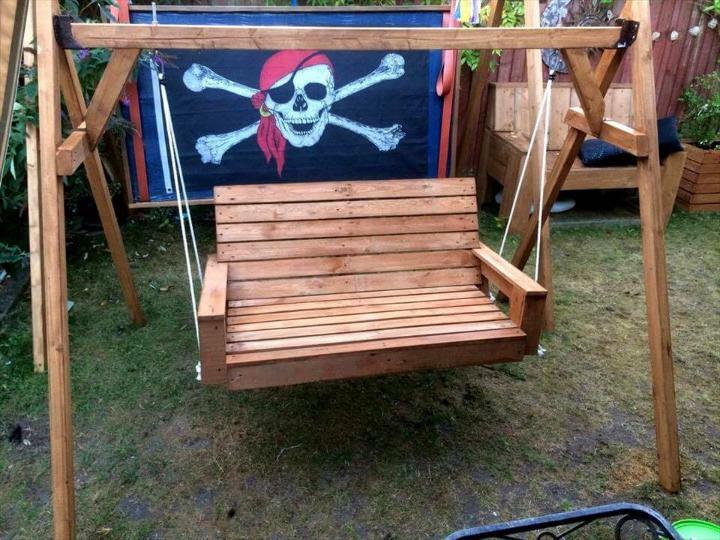 Here first of all the entire swing seat has been fabricated by putting together the pallet wood stripes , then it has been hanged in the swing frame made of pallets also through nautical rope, some handy but creative techniques you will learn in this pallet swing project will make you work a bit more easier! Swings are always enjoyable as they just lift you up to plenty of breezes, you feel like being in the air and this creates so much fun! So adding swings to your outdoors would be a great way to get them friendly to kids and bit more exciting! 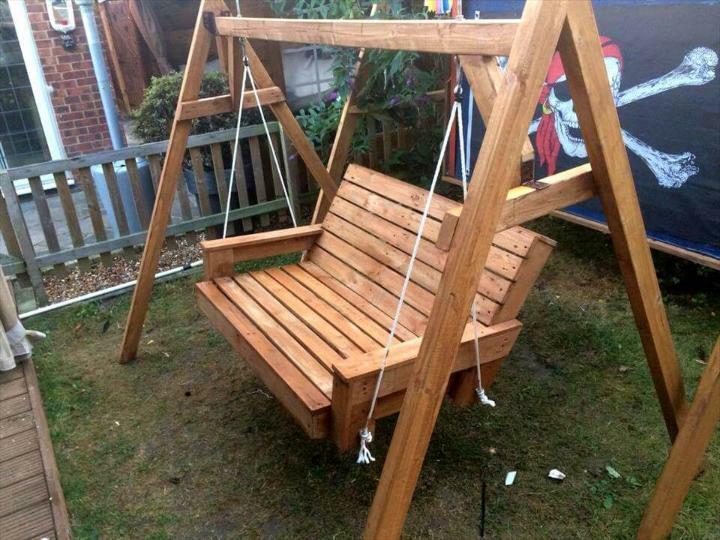 You can copy this pallet swing tutorial for a no-cost but lasting wooden swing! 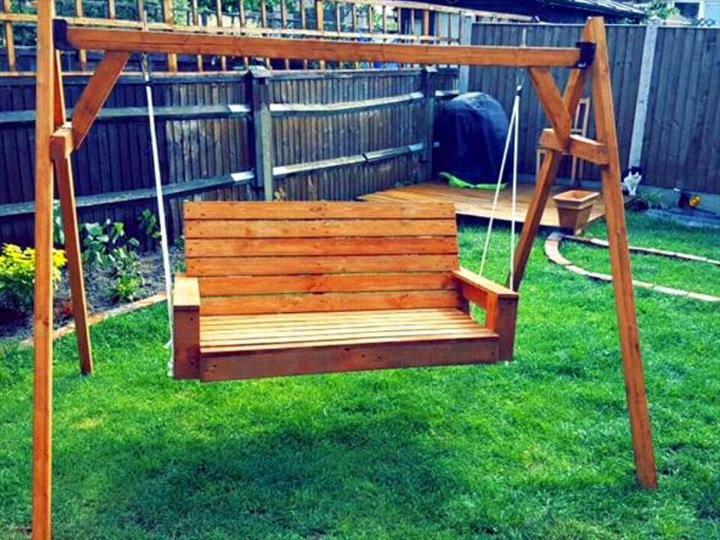 If you are have gone through some kind DIY pallet furniture projects then building a swing seat would be too easy for you, you can simple bring the 2 pallet in L-shape to build a robust swing seat! Here this marvelous wooden seat has been done by filling the pallet slats flat over the L-shape frame made of thicker pallet lengths! Here thicker armrest have also been planned out of dismantled pallet pieces! 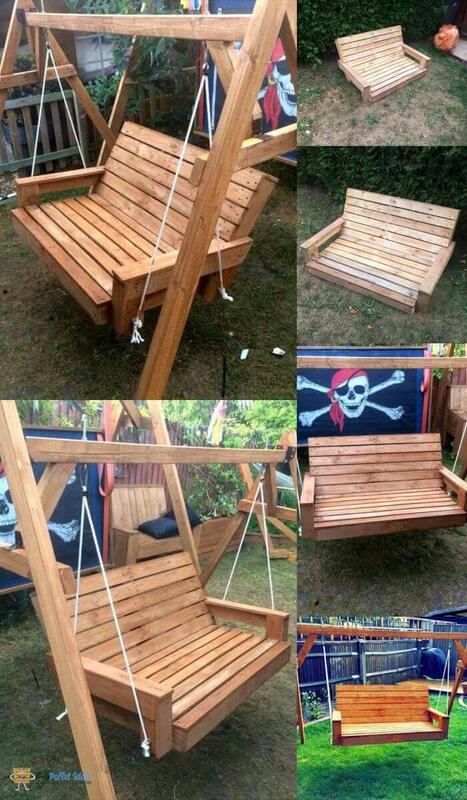 Sand the surfaces of the swing seats and just add eye-bolts to each corner of it to suspend it in the swing frame! 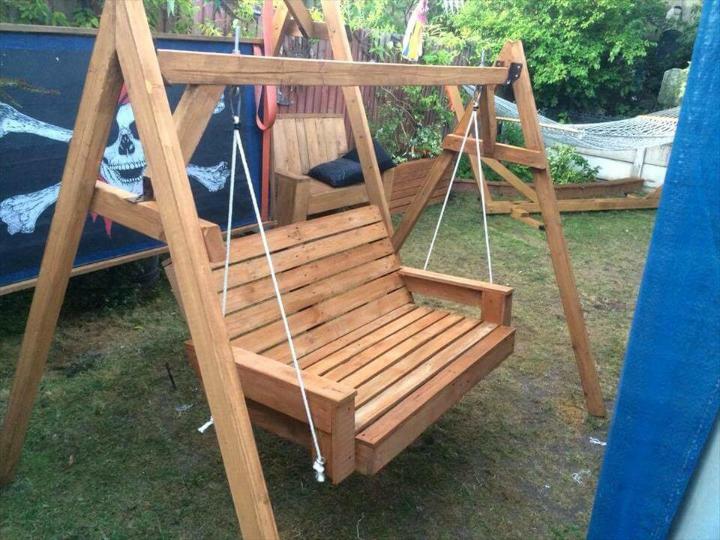 Here using heavy duty wooden lengths, the swing frame has also been built which comes with A-frame sides that holds very tight the cross beam holding the swing! Make the entire swing weather and water proof by applying custom stain coats, here it has been done using light walnut stain, bring a great allure to wood grains! Both A-frame sides of the swing frame comes with hardware holders installed to a equal height level using nuts and bolts, these holders hold the cross the beam that is having hooks to fasten the swing ropes or metal chains! To support the main cross beam more, extra wooden braces have been installed that provide a bit more support to main swing beam! Fasten the nautical heavy duty ropes to all eye-bolts fixed in corner of swing seat and fasten also the other ends of rope to aloft beam hooks! Seat should be hang in a balanced way here!